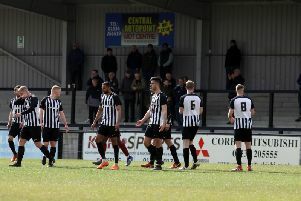 Corby Town’s title hopes may have suffered a big setback last weekend but there is still plenty to play for during the final two months of the season. And, with that in mind, boss Steve Kinniburgh has received the backing of the club’s board to strengthen his squad for the run-in. The Steelmen saw a six-match winning streak at Steel Park ended by a surprise 2-1 defeat at the hands of Dunstable Town last Saturday. eight points behind Evo-Stik League South Division One Central leaders Peterborough Sports and seven adrift of second-placed Bromsgrove Sporting. Barring a major collapse, Corby look well set to at least earn themselves a play-off place at the end of the season and Kinniburgh is keen to ensure they don’t allow the opportunity to gain promotion to pass them by. The Steelmen manager confirmed he held talks with the hierarchy at Steel Park this week. And, as a result, he has now been given the licence to add some new faces to strengthen his squad up for the remainder of the campaign. “I have had good conversations with some of the board over the last few days about where we are going and what direction we are heading in,” Kinniburgh said. “I gave my thoughts to them and they are going to back me in what I want to do. “We have got a good squad but we have probably not got the depth so my plan over the next couple of weeks is to see what is out there. “We are going to have a look around to see who might be available to us and we will look to bring a couple in to help us during the run-in. all about, we want to build those players with potential up and help them along their way. “The club will only benefit from that both on and off the pitch. The Steelmen are still set to be without right-back Miles Smith for this weekend. The defender has been out of action since suffering a thigh strain during the 3-0 victory over Coleshill Town on Boxing Day and remains on the sidelines.